BubbleTone developed a blockchain-based platform to provide direct connection between subscribers and mobile operators globally, at local rates for voice calls, messaging and data. Mobile users can log on to BubbleTone blockchain and look up offers from local operators in the country they are going to travel to. They then select an offer and download the mobile profile of the foreign operator — a small chunk of technical data — to their existing SIM-card. On arrival to the destination country, the mobile profile will activate and connect to the local network. This will make the traveller a direct subscriber with the benefit of using mobile services at local rates, completely bypassing expensive international roaming. And the customer can retain and be available on their home number, too. On the blockchain platform, technically complex and therefore costly inter-operator agreements are replaced by smart contracts. These are computer algorithms that make sure the service is paid for by a new subscriber and is then provided by the telecom company. No pre-arranged agreements are needed. If any of the parties fail to fulfill their obligations, payment is returned accordingly by an automated process. For telecom providers, BubbleTone platform eliminates the need to establish and maintain extremely expensive inter-operator roaming agreements, which are the primary reason for high retail roaming prices. Paxtradings: How does the BubbleTone token (UMT) function within the platform and why is it needed? Morozov: UMT token will have several functions on the platform. First, it is a means of payment for services within the BubbleTone ecosystem. The user can pay for voice calls and mobile data, as well as non-telecom value-added services, which can be delivered online by participating providers: music subscriptions, online language-learning packages, etc. We have already partnered with a top English language learning portal to market their service via BubbleTone platform. Also, the token is a tool of remuneration for the holders of nodes, the servers that process the smart contracts within the platform. Tokens are distributed among the nodes according to the type consensus established in the ecosystem, called Proof-of-Importance. It evaluates a range of properties critical to the performance of the system and is needed to incentivize the nodes to function properly and maintain platform efficiency. Paxtradings: How does your company separate itself from other blockchain based telecom projects? Morozov: As telecom professionals, we certainly follow the developments in the industry related to the use of blockchain. We see a few projects claiming to use blockchain technology for a variety of concepts and business models. Some of them focus on sharing or trading quotas for mobile or WiFi access, while others aim to “tokenize” different aspects of network communications. However disputable these aspirations can be in terms of legal compliance, technical validity and feasibility, so far we have not seen a single working blockchain-based product that would live up to a project’s promise. In contrast, BubbleTone’s does not mean to disrupt the established commercial operations in the quite conservative telecom industry, but offers new revenue streams clearly based on the decentralized ecosystem. BubbleTone is relying on proven and longstanding telecom standards for technical operations with SIM-cards and operators’ mobile profiles. Moreover, BubbleTone has already deployed a fast and robust blockchain-based platform customized for the needs of telecom operators and has partnered with major network providers around the world for research and implementation. Paxtradings: How does BubbleTone plan on achieving a network effect for the platform? Is the goal focused on more users first, more mobile operators and service providers first, or both simultaneously? Morozov: Our primary targets are, of course, telecom players and service providers. We are now partnering with major mobile operators and large service providers. Moreover, we are educating mobile users to better understand how the platform is structured and how it is beneficial for them. Paxtradings: One of the main value propositions for telecom users is that they are able to make calls and use data anywhere. How are you planning to scale the coverage? Are you planning to partner with any established telecom companies? Morozov: Providing direct connectivity to telecom operators in over 80 countries worldwide, we address both technological and economic aspects when it comes to scaling. BubbleTone has developed a very fast, high performance platform based on blockchain technology. It is optimized for handling a high load of operations in real-time, which is critical for the telecom industry. The platform is capable of processing over ten thousand transactions per second. It is future-proof and ready to accommodate usage by a very large number of customers. As more telecom companies join BubbleTone platform, we expect the impact on the operators’ revenues to become more noticeable. The decentralized nature of the platform enables mobile companies to scale their operations at their own pace. And the underlying blockchain technology is key for bringing out the competitive edge and allowing even the small-sized operators to join and rival their bigger contenders, globally. Paxtradings: Security of data has been a major concern for users. How is BubbleTone planning to make the network secure? Morozov: BubbleTone provides advanced security both for users and for telecom companies. To ensure best-in-class secure user verification, BubbleTone has partnered with California-based company ShoCard, the provider of market-leading digital identification solutions. For users, this system allows swift and safe authentication. For telecoms, this is a robust fraud-prevention mechanism. BubbleTone platform uses public and private key encryption and data hashing to safely seal and exchange identity data on the blockchain. Notably, the user’s private information is never stored or transferred outside of their mobile device. The foreign operator verifies that the data provided by the subscriber matches the sealed record stored by their home operator, proving that the subscriber has the same private keys that created the records. This means that the user is, in fact, the person that they claim to be, and they can be serviced on other operators’ networks. Paxtradings: Many network providers are throttling data for users during the time of high demand. What is the vetting process for your network providers? Will users have access to unlimited data with no throttling? 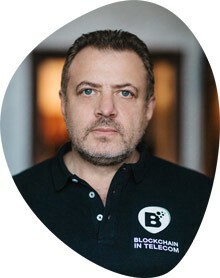 Morozov: BubbleTone offers the blockchain-based platform as a decentralized ecosystem for direct interaction between subscribers and network providers. We are partnering with well-established and robust carriers worldwide that provide a full range of connectivity to their customers. In a decentralized manner, users on the platform buy services directly from these network providers with the help of smart contracts. Customers therefore rely on the terms and conditions of the specific operator they chose to connect to. Detailed descriptions of all tariff plans are available for all to see on the platform prior to purchase. Paxtradings: What is your current international presence? Which countries fall under your primary market? Morozov: BubbleTone’s blockchain-based ecosystem is truly global and currently offers connectivity in over 80 countries. Our market is huge: according to numerous research, there are over 1.4 billion people travelling each year around the world. This figure is increasing annually, and the number of outbound travellers is expected to exceed two billion by 2022. We plan to follow and further target the real-life needs of global travellers. According to the International Air Transport Association, the demand for air travel is set to double in the next two decades, with the largest demand coming from Asia-Pacific. The region is forecast to account for over a half of new passengers over the next 20 years. Morozov: BubbleTone has successfully deployed the blockchain-based platform and showcased it at Mobile World Congress, the world’s largest event for all things mobile. We are partnering with major telecom operators and value-added service providers for testing and fine-tuning. Commercial operations are scheduled to start later this year. Concurrently, we are finalizing the BubbleTone mobile app that is set to be the end-user interface for interacting with mobile operators and service providers on the blockchain. Paxtradings: As a non-BubbleTone question, we like to ask for unique predictions for the ICO and cryptocurrency space in the future. Where do you see both in the next 3–5 years? Morozov: In our view, the investment capacity of cryptocurrencies will increase over the long term. It is set to rise along with further adoption by the mainstream financial market players. Whichever coin this would be in the long run, the digital currency will sustain its appeal to investors. Moreover, we should expect the advent of retail-oriented cryptocurrencies that will fulfill the demand for everyday, ubiquitous payments, with swift and secure transactions. The ICO space is certainly set to transform over the course of the next five years. We expect this to happen with the structuring of tighter, but more uniform regulations worldwide. Along with that, we will also see a change in how both the contributors and new businesses perceive the ICO. In the coming years, the ICO is certain to become a more reliable fundraising tool, with more transparency, enforcement and, therefore, a wider adoption. The main ICO will begin on April 20, 2018 and will end on May 20, 2018. There are a total of 500,000,000 BubbleTone tokens (UMT) available for sale, representing 50% of the total UMT supply. A hard cap of $25,000,000 is set for this period. Current accepted currencies for BubbleTone include Bitcoin, Litecoin, Bitcoin Cash, Ether, and USD. BubbleTone is an ERC20 token, so it’s important that contributors use ERC20 compatible wallets to send funds to the ICO smart contract, and to receive the BubbleTone tokens. First you will need to complete basic registration . 1. Visit https://ico.bubbletone.io/users/sign_up and fill out the Sign Up form. 2. Enter your email, choose a password (don’t forget to confirm it and agree to the terms of services) and click the Continue button. If you don’t get a confirmation email — click the “Didn’t receive confirmation instructions?” button. 3. That’s it — now you have an account on the BubbleTone token sale platform. Step 2. How to determine contribution amount? If you know the amount you want to contribute, but not sure about the token volume you’ll get — you use their internal convertor for fast and easy calculation. You’ll see how much you can spend in any currency and what amount of tokens and bonuses you’ll get depends on day of sales and the number of tokens you want to buy. This is how the converter works. Enter the specific amount of UMT tokens on the left side of the form. Choose your payment currency: Bitcoin, Litecoin, Bitcoin Cash, Ether, or USD. That’s it — on the right side you can see the amount you have to pay in your chosen currency and down below, your bonuses for purchase. After you calculate how much you would like to contribute for your portion of tokens, here is how you complete it. Important: Please note that depositing funds to your account doesn’t mean the purchase of the UMT tokens. After the funds are deposited, you need to complete Step 4 to purchase UMT tokens. If you want to purchase UMT tokens with any altcoins (not BTC), please note that the price of UMT tokens would be calculated at the time of actual purchase of the UMT tokens, not at the time of depositing funds to your account. We’ll use actual rate every time, when you make a purchase. To make a deposit in cryptocurrency, you need to choose your type of currency and generate your personal unique address for payment. After this, go to your wallet/exchange/mining pool account and send funds to this address. Please make sure your deposit equals or exceeds the minimum purchase amount (at the current exchange rate, it is 0.08676 BTC at pre-sale stage). Funds will appear in your BubbleTone account only after the transaction gets a few confirmations from the network. This can take from 10 minutes to two hours or more, depending on network current load and your transaction fee. After you make a deposit, you can buy tokens . Just enter the amount that you want (or use the “Spend all funds” button in your account), check total price and click the “Buy now” button. Now, you will receive UMT tokens. Tokens will be distributed to your account immediately — this applies to purchased tokens, bonuses for the purchase, or deposit. 1. Click on the ‘your profile’ on the bottom of step 2 in menu. 2. Enter your ETH wallet. Make sure that your wallet supports ERC20. Q1–2018 Initial version of smart contracts is ready. The first “Offer” and “Request” are on the Blockchain platform. Demonstration of the platform at Mobile World Congress in Barcelona (February 2018). Integration with major eSIM platforms to download mobile profiles onto SIM cards. Digital Identity into BubbleTone app. Commercial launch, with “Offers” from 10+ mobile operators are on Blockchain, low rates in 80+ countries. Q3–2018 Global Mobile Profile approval by International Telecommunication Union. Update Mini Nodes to participate in processing smart contracts. New features in the BubbleTone app: Voting platform based on Blockchain, 4K video conferences, transfer of fiat money and cryptocurrencies. Q4–2018 Expanding list of mobile operators and service providers connected to BubbleTone Blockchain Ecosystem. Q1 — Q4 2019 Signing agreements with mobile operators worldwide to activate the Global Mobile Profile. First prototype of a global SIM-chip to be embedded into mobile devices. The first one million transactions are processed. Creating a public offer for all mobile device vendors to implement the Global Mobile Profile in them. BubbleTone is the global decentralized distributor of mobile devices connecting to home carrier and abroad carriers. Expanding list of mobile operators and service providers connected to the BubbleTone Blockchain Ecosystem. 10 million transactions are processed. View the BubbleTone website here.